Traditional living will be realized with this elegant mahogany finished collection of occasional tables with soft serpentine lines. 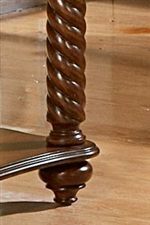 Make your living room a grand and luxurious looking place with elegant spiral turned legs and bun feet. 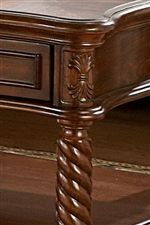 This three piece collection of sofa table, end table, and cocktail table have an abundance of detail that will fully express a traditional style room. Match these carving rich tables with a traditional patterned area rug and classic silhouette sofa and chair to enjoy the ultimate sophisticated classic lifestyle. Browse other items in the Trammel collection from Beck's Furniture in the Sacramento, Rancho Cordova, Roseville, California area.